Completed in August 2018 this is the first chance visitors will have to see inside the community-build homes built as part of the K1 Cambridge cohousing project at Marmalade Lane in Orchard Park. The visit will include an introductory talk about the project, followed by a choice of tours of the homes. There are a variety of house sizes and flats to see, each one built to very high environmental standards. Although developers have built the homes, co-housing is different because residents have more say over the development, and in the running of it now it is completed. 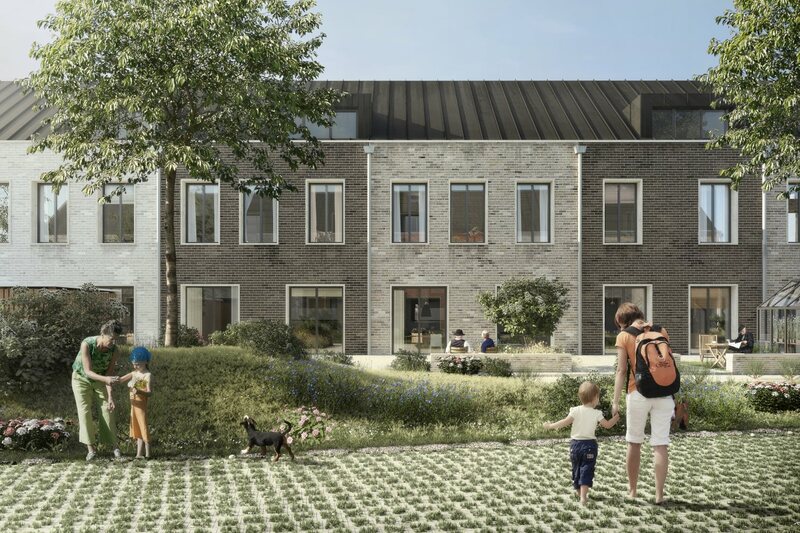 As well as having their own home, members will have access to a large shared garden, communal house (for guests and shared meals), office, workshop and gym. The homes will be highly insulated, the walls being constructed as timber panels in a factory in Sweden. Wall, floor and roof U-values will be around 0.18. Factory manufacture enables high standards of air tightness to be achieved. Triple-glazed windows and doors will be built into the panels in the factory. The homes will have a low requirement for heating, which will be provided by air source heat pumps and ventilated by mechanical ventilation with heat recovery (MVHR). No gas will be used on site; this is the choice of residents, who will be able to buy their energy from 100% renewable suppliers. Want to know more about community home building? Ian Collins of K1 is speaking at our workshop Co-housing and Community Land Trusts – Sustainable homes built for and by the community on Wednesday 26th September. NOTE: Open next year, date TBA, due to delayed completion of the build.